Jillian James has been a drifter for most of her life. She grew up traveling from place to place with her father, with no relatives other than him and no roots. When she was eighteen, her father left her on a college campus in Oklahoma, and she hasn’t seen him in the twelve years since. As an adult, she continues the peripatetic lifestyle she knew with her father. She has tried to follow his advice for traveling light: “Pack nothing from the past, not even memories.” But she has not been totally successful. A zip code in her father’s diary brings her to Laurel Springs, Texas, where she hopes to find some clue to his past and her own. Jillian expects her stay in the small town to be brief, a maximum of three months, but when she is hired by Connor Larady to catalog the quilts in his grandmother’s shop, A Stitch in Time, before they are moved to the county museum when the shop closes its doors after half a century, she begins to care about the town and its people and experience a sense of belonging that she has never known. Connor Larady is the mayor of Laurel Springs, the owner and publisher of a fading newspaper that his father and grandfather headed before him, and the manager of the family properties. After more than a dozen years of an unhappy marriage, his wife and her lover were killed in a plane crash, leaving him the single parent of a thirteen-year-old daughter, Sunnie, who over the past three years has seemed to move farther and farther away from him. Connor is also responsible for his grandmother, who has Alzheimer’s. He has little time for his own dream of writing children’s stories or for romantic relationships. But there is something about the stranger in his town that makes Connor wonder if he has found a friend. Jillian and Connor are diametric opposites. She is a rootless wanderer with no family and no knowledge of her heritage. Connor is deeply rooted in a town where generations of his family have contributed to the community, and he is devoted to his daughter and his grandmother. But as they find in each other something they need, a genuine friendship develops and grows into a love neither can deny. Jillian finds that she is making memories with Connor, with Gram, with Sunnie, and with a host of others, memories that she knows will always be a part of her. But can she who has known only the temporary accept the permanence of love that is offered by Connor, his family, and the community? 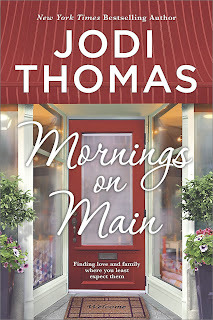 In this standalone novel, Jodi Thomas gives her readers all the elements that they have come to expect in her popular series—a story masterfully told, quirky characters who capture the reader’s affection, and a focus on the ties that connect the lives of generations of family and friends. Undergirding all is a sense of community strong enough to encompass even the outsiders. Jillian and Connor are multi-dimensional characters, each with a compelling story independent of the romance. They are sympathetic characters, and the reader is invested in their happiness and fearful that it will escape them. Only the fact that this is romance keeps the doubt that Jillian will leave under control. Other things I love about Jodi Thomas’s stories include the strength of her secondary characters and the ways their lives intersect with the lead characters. Gram, Sunnie, Joe (Gram’s life-long friend), and others add color and provide flashes of humor and heartrending poignancy. The scene where Gram realizes her memories are leaving her had me in tears. The quilts work thematically to keep memory a unifying presence in the novel, and the quilt in that scene was especially effective—and affective. This is one of those books that I loved as I read it and that left me thinking about the characters after I turned the final page. 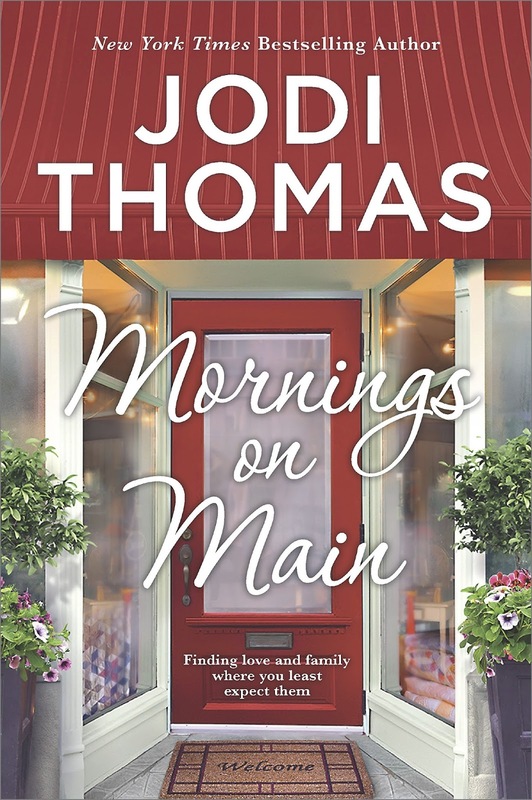 If you are looking for a story that will pull you into its world and leave your heart newly tender, I suggest you add Mornings on Main to your TBR list. I have seen no indication that this novel will be part of a series, but I am keeping my fingers crossed that one day Thomas will return to Laurel Springs and give her readers Sunnie’s story. You have made this book sound like such a terrific story. Thank you. I love Jodi Thomas and I am putting this on my TBR list. Definiteley on my wish list. I've been waiting for the next Jodi Thomas book and your review made me even more eager to read it. I have read and enjoyed many of her books. This sounds like another to add to my Wish List.. I still have some catching up to do. Sounds like a wonderful read. Now if there were only more hours in the day. Adding to my tbr pile. I've enjoyed her stories - sounds good. I have been hearing wonderful things about this book and plan to read it for myself in the near future. Enjoyed your review.